2.1.0 was released a bit early for the sake of fixing some bugs. Here's 2.2.0, featuring Pokémon natures! Like in Gen III, they raise and lower stats by 10%. They're determined from DVs, kind of like Hidden Power's type, since personality values don't exist in Gen II. This update is compatible with save files from 2.0.0, 2.0.1, and 2.1.0! Just patch a fresh Crystal ROM to 2.2.0 and use it with your old save file. 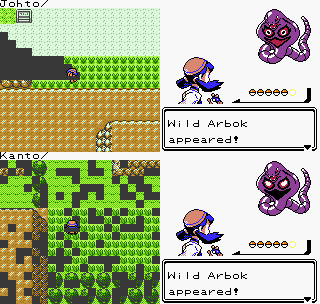 Patches should be applied to a Pokémon Crystal (UE) (1.0) ROM. The one I used has the MD5 hash 9f2922b235a5eeb78d65594e82ef5dde if you need to make sure your copy is correct. Add: Natures (based on Atk/Def DV, not personality value). Add: Descriptive text for certain rock features. Add: Edit some trainers' rosters, including better natures. Add: Vulpix can learn Moonlight. Add: Staryu+Starmie can learn Calm Mind. Add: Wobbuffet can learn Recover. Add: Entei can learn Earthquake. Add: Lugia can learn Hurricane. Fix: Lugia's room music loops. Fix: Dragonite can learn Hurricane. 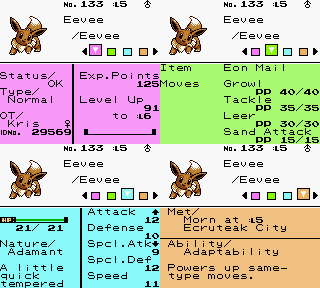 Fix: Metronome cannot become Transform. Fix: Bill can walk through you. Fix: Acid and Crunch descriptions. I love how you did demakes of songs from later games in the series. I spent about three minutes before continuing with Lyra's Pokémon catching tutorial just listening to her motif. How on Earth did you get such great sounding demakes!? Mmmmmm, Pum, Pigu, FroggestSpirit, and ShantyTown are responsible for the music. Being able to use their work, as well as other artists' custom sprites, is a big reason I started this project in the first place. I'll have to check out their work then. No problem, updated the credits. 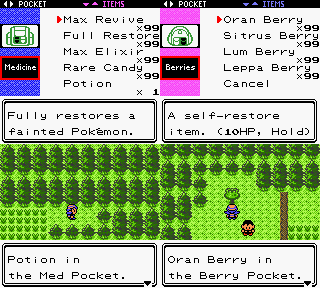 You can carry 25 generic items, 20 medicines, 16 Balls (one of each), and 17 Berries (one of each). The PC holds another 20 items. I might get rid of the PC and let you carry 45 items. This is about an upcoming release, right? At any rate, I think that's a good idea, having more pockets in the bag. That way, everything is more organized. And the only thing I ever used the PC for was mostly to store Evolution Stones as well as whatever Mom bought with my money that she was supposed to be saving and not spending. You might want to keep that last one in mind if you decide to get rid of the player's PC. Most updates have been behind the scenes lately, but a visible feature I'm working on is Battle Points. You can earn 3 BP from each 7-trainer streak in the Battle Tower (instead of the 5 random vitamins you got in the original Crystal), and 1 BP per day from Cal or Kay in Trainer House. The rewards aren't implemented yet, but you'll be able to buy items with BP, kind of like Buena's Blue Card points. They'll include new held items, which I have room to add now that TMs and HMs are implemented separately from items. New quality of life feature: see how many of an item you own before buying it. 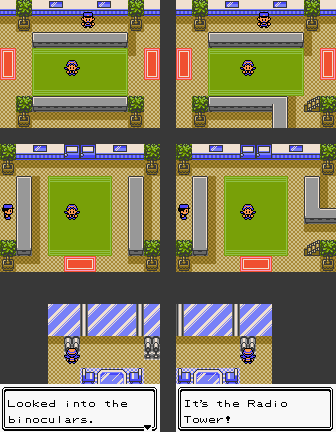 First of all, I've shamelessly copied yet again from TPP Anniversary Crystal, so Polished Crystal 3.0 will have field move portraits. Second, some custom graphics. The Pewter Museum meteorite has a sprite, just like the three fossils; and the Red Gyarados is larger. Here's the revised Faraway Island. Trees and grass are separate shades of green. Unfortunately I had to remove the highlights from the tall grass because the palette just cannot accommodate them. It's a worthwhile tradeoff. And Mew now wanders around, though you can't really see the new sprite through the grass. When you use a field move like Surf or Fly, you'll see a picture of the Pokémon using it. And all such pictures, including the ones for the starters, are colored correctly. The roofs of Goldenrod Dept. Store and Celadon Mansion now have proper night skies. Also, you can Fly from them. A slight tweak to the stats screen: HP is grouped with the other stats, and the OT and ID are moved to the main page. NPCs can have nicknamed Pokémon. The Beauty who brags about her "unique and beautiful" Pokémon gets one (it had Seals in HG/SS, it's shiny here). Schoolgirls also tend to nickname their starters. 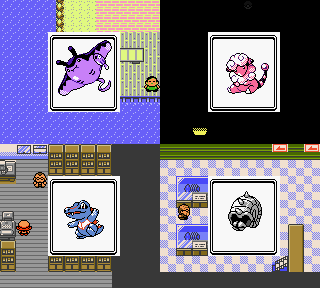 Gate houses in Kanto look different from the ones in Johto, using Mateo's devamped FR/LG tiles. I also added the upstairs observatories; no NPCs yet, but the binoculars work. Last edited by Rangi; 3rd November 2016 at 01:05 PM.